A potato, whether grown for the table, the processing plant, or as a source of seed for other potato growers, is a unique and sometimes unappreciated cash crop. Its food value is mainly due to the high starch content (12-20%) and the fact that potatoes are an important source of vitamin C. Potatoes also contain 1.5-2% fiber and minerals. Yet the dominant ingredient in this tuberous root crop (making up 75-80% of a potato’s total weight) is water. Little wonder that lack of moisture is the major limiting factor in the production of potatoes. 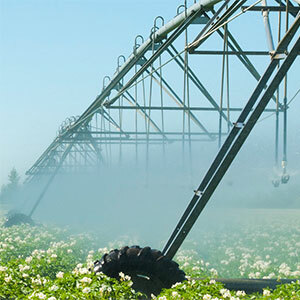 That’s why irrigation has become a common practice among potato growers who use it to both increase yields and eliminate the risk of loss due to periods of dry weather. Experience shows that the best potato yields are obtained when daytime temperatures don’t exceed 80 degrees F and when adequate water is available, especially during the period of tuber formation. High temperatures at this time can cause the plants to use more of the carbohydrates (produced during photosynthesis) for leaf and stem growth, and not enough for the growth and development of the tuber. A readily available supply of moisture helps ensure high yields and the development of tubers that are uniform and normal in size and shape. Timely irrigation is also effective in reducing heat stress since the moisture helps to cool both the soil and the plants. Let’s go through an example, certified potato seed growers who farm in Montana, US. For two years out of every eight, their land under center Pivots is scheduled to produce certified seed potatoes. Other crops grown in rotation are alfalfa and wheat. They decided to try center pivot irrigation on their land to save time and reduce labor. After two seasons operating center Pivots and other irrigation methods, they discovered they were using less water with the Pivots, and using a lot less labor. Their systems must operate on rolling ground with slopes up to 10 degrees, so they were designed with slightly shorter spans (164′) and high flotation tires for better flotation and traction. They operate at 800 GPM and are equipped with end guns which add an additional 100-110′ of coverage. Potatoes require about the same amount of total moisture as alfalfa, but the water must be delivered on a more timely basis. When growing certified seed potatoes, the timing and the amount of irrigation water applied is often critical. Center Pivots let them water the entire field for as long as dry conditions last. Under hard conditions (when the temperature jumps to 90 degrees), it’s difficult, sometimes impossible, for other irrigation methods to keep up with the crop’s moisture needs because of the time and labor required. But with a good water supply and properly designed center Pivots, they’re not risking yield losses as they are with other irrigation systems.